New Meeting - When creating a new meeting. For further information, please see the next section. Edit Meeting - For any meeting that was created by the user or should be managed by the user. For further information , click here. Meeting Invitation - For the meetings that the user was invited to. For further information , click here. Creating and Editing events are also available from the Relationship label in the Client / Supplier card. Main - In this label, the user should fill in the relevant details of the meeting. Ext Fields - This label is used to add additional fields according to the user needs. After creating a meeting, this window will have additional labels, as described below. Subject A short description of the meeting. From Hour / Until Hour The suggested time frame for the meeting. Tentative - The user has not confirmed or Canceled his participation. confirmed - The user has confirmed his participation. Canceled - The user has Canceled or rejected his participation. For User This field defines the leader of the meeting. For "Edit Meeting" window, this field describes the leader of the meeting. For "Meeting Invitation" window, this field contains the invited user name. In that case, the user is not the meeting leader. Internal Notes This field is used for internal notes and notifications that will not be revealed to recipients from out of the organization. Use the Add Recipients in order to choose the relevant recipients for the meeting. In the "Add Recipients" window, the user can search and add Clients / Suppliers / Colleagues / Personal Contacts. In order to remove recipient, use the "Delete" button of the keyboard or alternatively use the right click and choose "Delete Selected Rows" from the menu. Please Note - in order to add a Client or Supplier in the "Add Recepients" window, they must have Hyper card that includes the relevant contact details. It is also possible to add recepients that do not have any card in Hyper. In order to do so, Manually add their details in the "Attendees List (also Recepients)" table, in the Main tab. Use the "Send Private Notes to Attendee" field, to send any pruvate note that will be send to the selected attendee only. Add new rows to the table by pressing Ctrl+Enter or use the right click menu. By using this button, only the creator of the meeting can watch it. This button allows to watch the schedule of the recipients (according to authorizations) in order to verify their availability. Update the time frame of the meeting to a long term. This button changes the Fields "From Hour" / "Until Hour" to "starts" / "Ends" that allow the user to choose dates (not only hours). The system will autocratically send updates for any modification made in this meeting details. As default, this button is active and this option can be Canceled by clicking on this button again. This label is used to add additional fields according to the user needs. Edit Meeting - For any meeting that was created by the user or supposed be managed by the user. Meeting Invitation - For the meetings that the user was invited to. Please note - The modifications list is available in the "Modifications Log" label. Also, the amount of the modifications is counted in the "Sequence" field, in the Main label. This option is available for the creator or the leader ("For User" field) of the meeting. 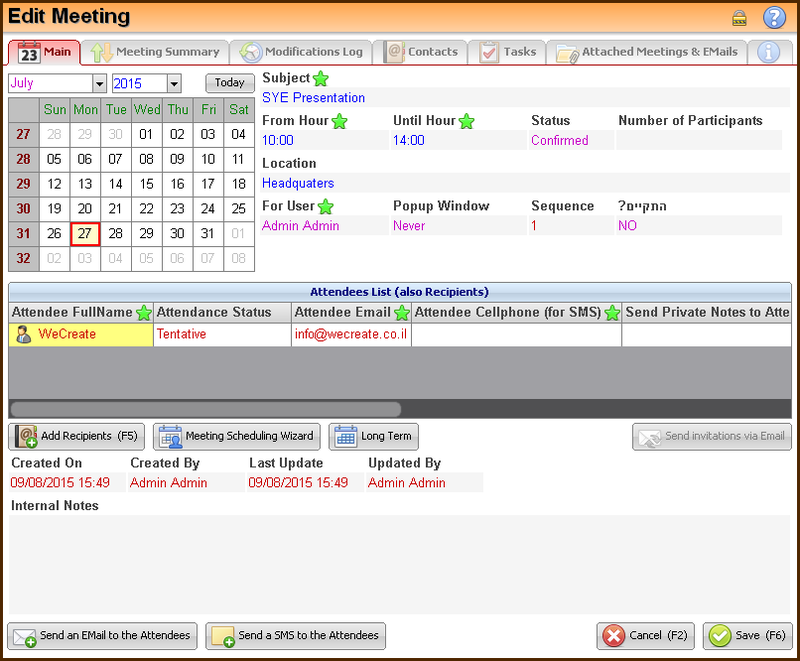 An automatic pop-up message asking to fill in the Meeting Summary, will appear after the meeting ends. This message will appear according to the chosen value of the field "Enable Meeting Summary Nagger", in the personal details of the User Card. This label contains the modifications made in this meeting. Send an Email to the Attendees/th> This button is used to send an Email message with the meeting details and allows the user to edit the details and add a comment to the message. Send a SMS message with the details of the meeting to the recipients. This label presents all of the tasks that related to this meeting. The Create New button is used to create a new Task related to this meeting. Sub Event - Create an additional meeting to the current meeting. This option is available for the creator of the meeting. The table presents the details of the original meeting, marked with and the details of the Sub Event, marked with . The action buttons in this window are used for refreshing the list, creating a new Sub Meeting and Editing meeting details. Repeating Event - Create a repeating event with a chosen frequency. The creator of the repeating event should define the repeat frequency and the attendees. Email - The list of the Email messages that were sent to the attendees of the meeting. Open an exist meeting for modifications. Print the calendar according to the current display. Print a list of meetings on required dates. Allows to modify the shifts time or update a Sick/Vacation days, according to authorizations. The system Admin should define a duty fields for any new meeting. These fields should be defined in the Fields Rules window. In order to set the local Holidays and special dates in the Calendar, open the Agencies label of the System Fundamentals and choose the local calendar in the "Add to Calendars" field. YES - Five days view. No - The calendar will include the weekend days. Every meeting modification will be automatically sent to any of the attendees and recipients. In order to define this options, open the "Global & Basic Setting" label of the System Fundamentals. In the "send Calendar Updates via Email by Default" field, choose whether to use this automatic option or not. Fields for "Calendar Meeting Window"
Each of the meetings squares presents some of the meeting fields as a preview. In order to choose the preferred fields for this preview, open the "Global & Basic Setting" label of the System Fundamentals. In the "Fields for Calendar Meeting Window" field, choose the required fields from the list. The length of the presented information is limited due to the preview window size. The organization can decide to limit the total number of participants in any of the meetings. This should be defined in the "Global & Basic Setting" label of the System Fundamentals. In the "Calendar Limit Total Number of Participants to field", fill in the maximal number of participants. In the "Agencies" label of the System Fundamentals, use the "Local Date Mask: Day Before Month" field to determine the required Date Mask. By choosing "NO" the Date mask will be Month Before Day. In the Employee User Card, in the "Employment Details" label, the users shift hours should be defined. The squares of the shift hours in the Calendar will be marked with a white background. The agency meetings in the Calendar can be marked with a background color. In order to choose a color, open the "Agencies" label of the System Fundamentals and choose the color in the "Team Calendar Color" field, By choosing the black color, the agency will have no background color.